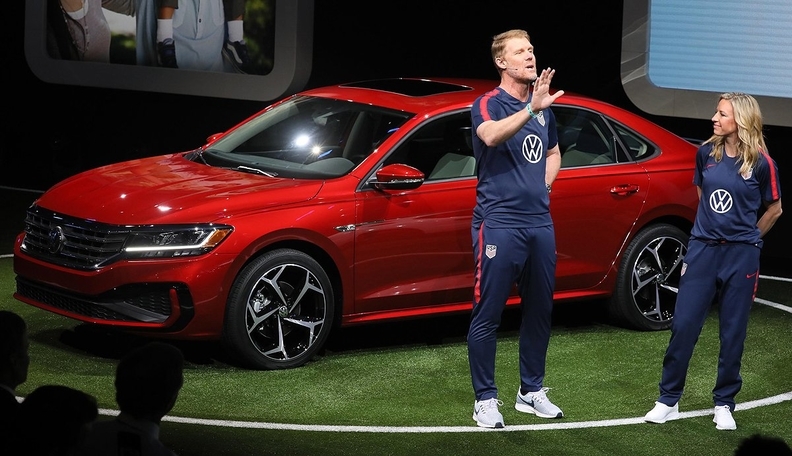 Alexi Lalas and Aly Wagner of U.S. soccer fame appeared with the 2020 VW Passat on stage at the Detroit auto show on Monday. What started as an organic effort among Volkswagen dealers to support local youth soccer programs has grown into a new nationwide integrated marketing sponsorship of the sport in the United States by the German mass-market brand. VW has signed an agreement with the U.S. Soccer Federation to be its presenting automotive partner through 2022, Volkswagen Group of America CEO Scott Keogh said Monday at the Detroit auto show. VW's initial contribution to the program — which it's calling One Goal — will be a funding effort to train and encourage more female soccer coaches. According to U.S. Soccer, 47 percent of youth soccer players are female, but only 15 percent of coaches are. Under the agreement, VW's logo and vehicles are to be prominently displayed in soccer stadiums and in soccer advertising over the next four years, including both the men's and women's U.S. National Soccer teams as they compete in the World Cup. The U.S. Women's National Team is the defending champion and will seek its second consecutive world title during the 2019 FIFA Women's World Cup in France later this year. John Luciano, chairman of the Volkswagen National Dealer Advisory Council, said the tie-in with soccer grew organically after VW introduced the Atlas three-row crossover in 2017 and dealers sought to help their local soccer programs. He called the association "a natural fit" between the German brand and the sport, as it tries to grow in the U.S.